In a program whose history is littered with championship titles and Olympic athletes, Sandra Whyte Sweeney remains a standout. She is 9th on Harvard’s career scoring leaders list with 140 points (85 goals, 55 assists). She also holds spots on the 20-goal single season scorer list, where she remains tied for 18th with 27 goals (1989-90 season), 28th with 22 goals (1988-89 season) and tied for 29th with 21 goals (1991-92 season). 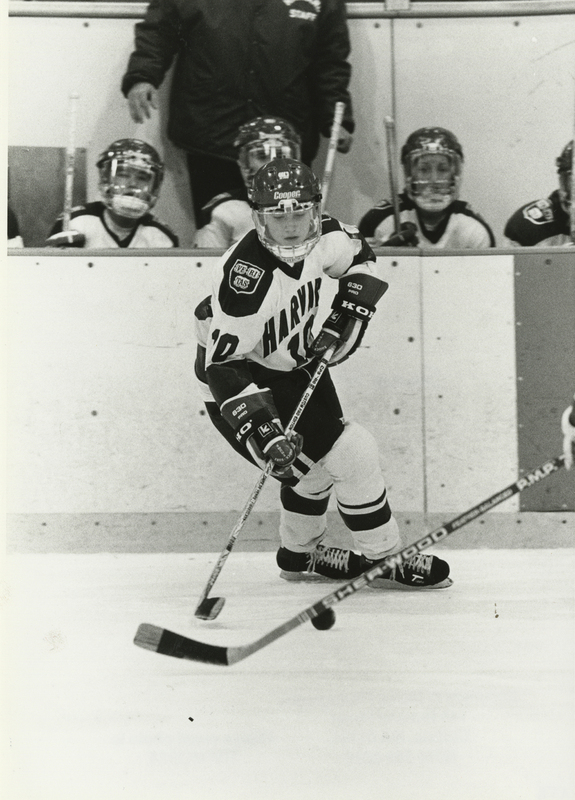 A First Team All-Ivy selection in 1989, 1991 and 1992, Sandra was also honored as Beanpot MVP in 1992, the Ivy League Player of the Year in both 1991 and 1992, and the ECAC Player of the Year in 1991. Sandra was a five time member of the U.S. Women’s National Team. As a member of the 1998 U.S. Olympic Women’s Hockey Team, Sandra had two assists and one goal in the championship game, leading the way for the U.S. to capture the gold medal. I would like to thank the Harvard Varsity Club and the Hall of Fame selection committee for the honor of being inducted into the Hall of Fame alongside so many remarkable athletes. When I think about Harvard Women’s Hockey I reflect not on my individual or team accomplishments but rather on the success of the program and the strides it has made over the past fifteen years. It has been tremendously satisfying as a former player and current fan to have witnessed Coach Katie Stone and her staff develop Harvard Women’s Hockey into one of the premier college hockey programs in the country. While presently there are only a handful of women’s hockey players in the Hall of Fame, the number will surely increase dramatically in the near future as Coach Stone and the program now attract the best of the best student athletes to Cambridge. And as we relish and applaud the continued success of the women’s hockey program and its athletes, I also think that it is appropriate to acknowledge the many woman hockey players who built the foundation of the Harvard program with little recognition. I feel particularly indebted to the women of the 1970’s and early 80’s who established the first women’s collegiate teams and paved the way for me to play at the collegiate level and beyond. In 1988, as a graduating high school senior, I considered myself fortunate to have been able to pursue hockey at one of roughly ten colleges and universities fielding Division I hockey programs. It is remarkable that today graduating seniors have the opportunity to choose among seventy-eight colleges, thirty-three competing in Division I. Those women who played a decade before me were also pivotal in establishing the growth of women’s hockey at the international level. The first Women’s World Championship, sanctioned by the International Ice Hockey Federation, and my first year on the women’s national team, was in 1992, the year I graduated from Harvard. I often reflect that had I graduated just a year or two earlier, I may have had to leave hockey behind like so many talented women before me because of lack of this opportunity. At that time opportunities to play competitively beyond college were limited. For me, however, the next six years were filled with opportunities to play at an elite level. There were national training camps, international tournaments, off-ice strength training with elite coaches, an Olympic tour, and of course, the first Olympic Games and gold medal for U.S. women’s hockey in 1998. I embraced and relished each and every opportunity. I trained and played with a determination and focus to remain a top player in the national program and to earn the privilege of being able to participate in all of these “firsts” for women. And for having that privilege, I am grateful to those who helped make the growth of women’s hockey happen. I would like to thank my Harvard coaches John Dooley, Bill MacDonald, E.J. MacDonald, Julie Sasner, Arthur Johns, Paul Boudreau and T. Kennedy for making my Harvard Hockey experience above all else fun. I also would like to thank my teammates from the classes of 1989-1992 and acknowledge their part in my achievements. Although, I am inducted here today as an individual, hockey is never about one player. I could not have been successful without the support and encouragement of my teammates. It is difficult to explain the appreciation and affection that I feel for them. I am grateful for their acceptance, their time, their laughter, for inspiring me, teaching me, and helping me to learn so much about who I am and who I strive to be everyday. I would also like to express my love and gratitude to my parents, Ed and Judy Whyte. I know that without their unwavering commitment and support for all of my academic and athletic endeavors, my success at Harvard and beyond would not have been possible. I also am grateful for the love and support of my husband John. I realize that during my years competing for the U.S. national team I was not always very good at balancing my life outside of hockey. My training and preparation became a full time job, an around the clock obsession, that left little time for putting anyone or anything else first. I am grateful for his understanding and patience during these years and for always being my greatest advocate.